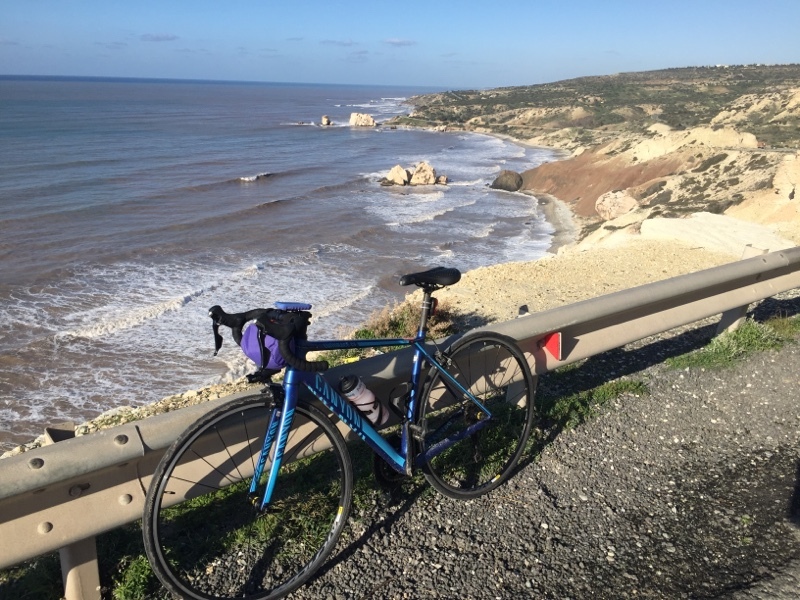 As well as wanting to escape the greyness of England we thought it might be a nice idea to continue with our 200km Audaxes by doing one in the Cypriot sunshine. Geoff found it quite difficult designing the route and it was soon decided that it would have to be an out and back with a few loops to make up the milage. In the end we settled with a route that was 204 km. After 3 days of rain and storms, the worst they have seen for 20 years, a good weather day was predicted so we submitted our DIY Audax entry and hoped for the best ,we woke to clear skies,it looked the perfect Audax weather day. We left at 7am just as it was getting light, the first loop through Paphos was a little irritating especially on a bike I was not used too, a cleat that was proving hard to clip in and the morning work traffic. Once out of Paphos though we enjoyed the ups and downs of the coast road which bought many wonderful views as we passed Aphrodite’s birthplace . Then on our way to the Episkopi we had to make our first detour due to the road turning to sand, great for mountain bikes but not lovely Canyon road bikes. 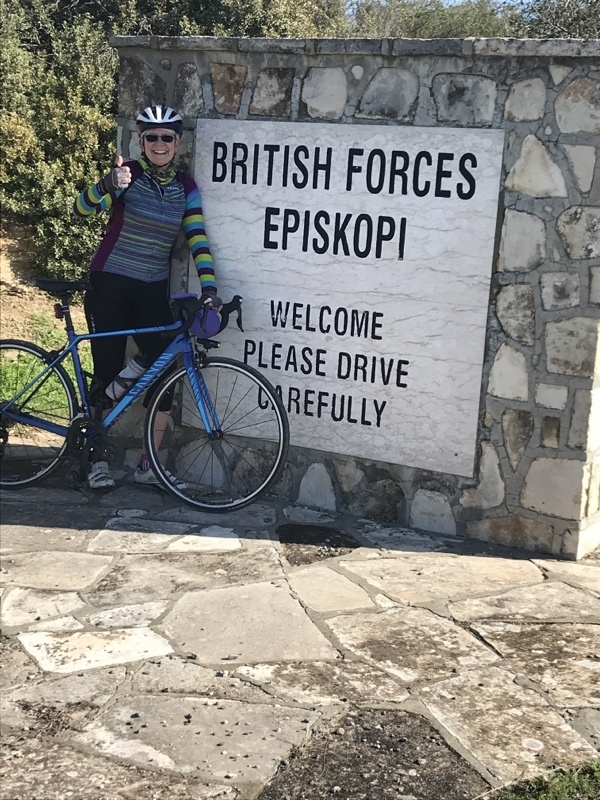 The climb up to Episkopi was made more enjoyable by the fit military guys running up the road,it was impossible to catch them ! Then it was on to Akrotiri where we had to make another detour when the road just disappeared into the salt lake. Finally we made it into Limassol via the very busy dock road here we stopped for some food and to prepare for the ride back. 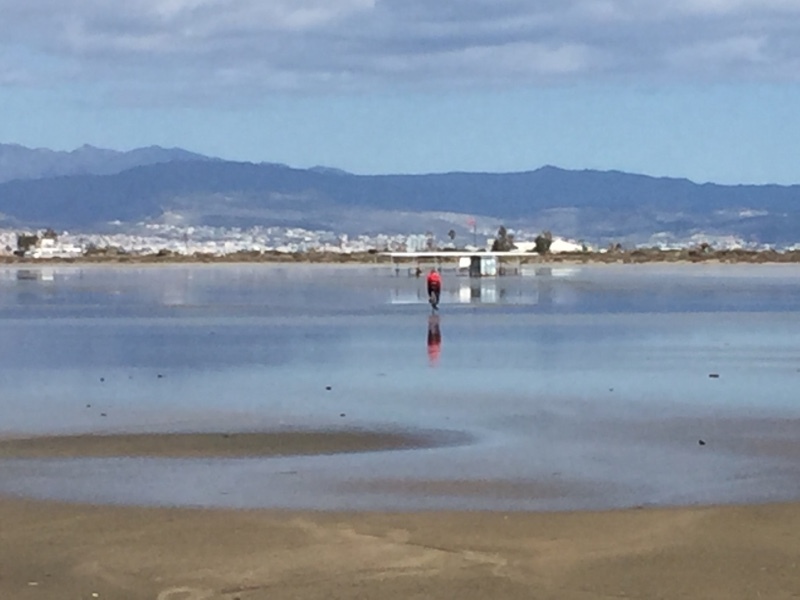 We started by meandering through Limassol’s busy city roads, the kind of riding I hate but we made it safely out the city thinking it would be an easy ride back along the roads we had come. Where did the road go! Just when we thought we were home and dry, travelling at speed along the newly serviced road between Paphos airport and Paphos the unthinkable happened and Geoff had a fall !! There was a good gap between us and suddenly,I just realised Geoff was down,by the time I reached him he was back up but bleeding heavily. It soon became obvious that most of the blood was pouring out his nose,so once I sorted that the best I could,we decided to continue into Paphos,then stop and decide what to do. Luckily no damage was done to the bike. Funnily enough the next suitable place to stop was a MacDonald’s, the other customers were quite shocked by Geoff’s appearance,we were asked if we needed any help but as his face only appeared grazed and his nose had stopped bleeding we decided to continue and finish our Audax. So with the detours it ended up as 134 miles In13 hours 29 mins with one puncture and we are just hoping that Audax will approve these . I was highly impressed with my Canyon bike not one ache or pain after all those miles . The following day we paid a visit to the Doctors’s/ hospital where a broken nose was discovered!!! This entry was posted in Personal on January 19, 2019 by Sally. This brought back happy memories from when I was in the forces based in Episkopi and cylcing up Trudos. I remember going on detachment with the RAF to Akrotiri so a trip down memory lane for me too … not that I can remember much just the heat !! As it was in summer time .